Quote: Hey where would one look to find a really good/legit interpretation of the bible?? Maybe something that walks you through page by page. I've tried reading it before and I really can't grasp the language used in it. I think your friend's jumping ahead a bit. What did he dislike about CCD class? Does he believe in any sort of a god? He's obviously open to Christianity or he wouldn't be asking, but there's much more to the faith than the Bible. I think something like the Baltimore Catechism is much more suited for a beginner - yes, it's meant primarily for children, but it's much plainer than the Bible, and if you're not familiar with Catholicism at all - he admits his knowledge is almost non-existent - then you have to start with the basics. Maybe he won't accept everything in it right away. The first question in the #3 version (meant for teenagers) is Q. What do we mean by the "end of man"? A. By the "end of man" we mean the purpose for which he was created: namely, to know, love, and serve God. Maybe he disagrees with that. But it's what Catholics believe, and can lead to further questions. If he absolutely insists on reading the Bible, as much as I prefer the Douay, I'd suggest something with more modern language like the RSV-CE, and reading the first few chapters of Genesis up to Noah, and then the Gospels. But he's at a child's understanding of religion, and we don't give primary school students Shakespeare and expect them to understand it. There's a reason the Church has the catechumenate, whether RCIA or the more traditional individual instruction by a priest, and doesn't just hand them a Bible and tell them to read it. If he has no prior knowledge, the Scriptures are going to be a daunting thing to approach for him. It's probably best to give him a more basic resource that isn't so easy to misinterpret to go along with the Bible. That said, Scripture is incredibly powerful and God has moved countless hearts through its words. I'd recommend him one of the Gospels to begin with, Matthew or John is probably best but Mark and Luke will be good as well. "If your heart comes to feel a natural hatred for sin, it has defeated the causes of sin and freed itself from them. Keep hell’s torments in mind; but know that your Helper is at hand. Do nothing that will grieve Him, but say to Him with tears: ‘Be merciful and deliver me, O Lord, for without Thy help I cannot escape from the hands of my enemies.’ Be attentive to your heart, and He will guard you from all evil." and stillness give the correct law to all under heaven." I see where you are both coming from. I agree that something other than Holy Scripture would be better for faith formation. But we live in a time when many think of Scripture almost as classic lit. This individual asking for a Bible recommendation may have heard Jordan Peterson talk about the Bible’s importance and may want to see for himself. I feel he may be turned off if I instead recommend a Catholic catechism. I am also on board with introducing him to the RSV-CE. You also might consider introducing your friend to the RSV-CE Study Bible that is just the new testament so it will aid him in his reading. Pics below of both. If the Bible intrigues him after he's done some reading then you could recommend some Catechism materials. (02-13-2019, 02:07 PM)Bryan M. M. Reynolds Wrote: This individual asking for a Bible recommendation may have heard Jordan Peterson talk about the Bible’s importance and may want to see for himself. I'd ask him what his interest is. Does he want to learn about the Catholic faith but associates "Bible" with "learning about religion", given the general Protestantness of the culture, or is he really just interested in the Bible as literature? I know there are Catholic commentaries on different books of Scripture, although I haven't read them to know which ones are good, but maybe something like that. But even if he isn't to the point of wanting to become Catholic (or come back, as 'CCD' makes it sound like he's already Catholic, just fallen-away), he might still be interested in the Catechism as a sort of background to the Bible. A 'Here's a summary of what Catholics believe and what the Catholic faith is really about' sort of thing, and then, with that in mind, maybe the Gospels will make more sense. Maybe the Catechism #1 would be even better, since it's the very basics of the faith, and not even the whole thing - he doesn't really need to know all about the Church and the liturgy and the Sacraments and what the Church teaches on various moral issues yet, just about who and what God is, who Jesus is, and man's relationship with Him. St Luke's Gospel might even be better to start with than St Matthew's - you get John the Baptist, the Annunciation, and the Nativity in the first few chapters, and everyone knows about the inn and the animals and the shepherds. The "problem" with St Matthew is that his Gospel is full of references to the Old Testament, which might make it harder to understand for a beginner. And St John's is primarily about our Lord's divinity, and also requires a bit more knowledge to understand. The beginning of it is really nice, though. (02-13-2019, 02:26 PM)SeeTheLight Wrote: I am also on board with introducing him to the RSV-CE. You also might consider introducing your friend to the RSV-CE Study Bible that is just the new testament so it will aid him in his reading. Pics below of both. 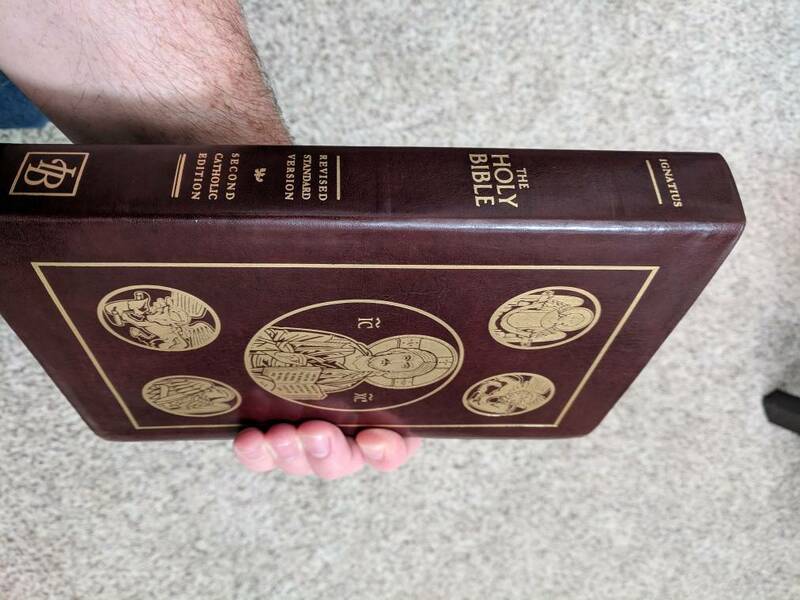 What's the Study Bible? Does it include commentary and such, or is it just a smaller size to make it easier to carry around? (02-13-2019, 02:07 PM)Bryan M. M. Reynolds Wrote: I see where you are both coming from. I agree that something other than Holy Scripture would be better for faith formation. But we live in a time when many think of Scripture almost as classic lit. Good point, we gotta remember that there is no one perfect book or resource for this, it has to be tailored for the individual. 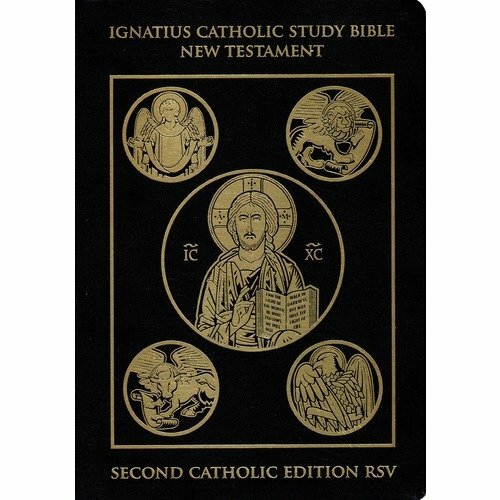 Quote: The only Catholic Study Bible based on the Revised Standard Version 2nd Catholic Edition, the Ignatius Catholic Study Bible New Testament brings together all of the books of the New Testament and the penetrating study tools developed by renowned Bible teachers Dr. Scott Hahn and Curtis Mitch. Trim size - 7" x 10"
This edition does not contain study questions. My vote would be for St. Luke also can't go wrong with the Physician.